Around 200 scholars, representatives from governments and nongovernmental organizations participated the second Asia-Pacific Urban Forestry Meeting, hosted by Korea’s state-run forest agency, to seek ways to resolve urban pollution by expanding greener spaces in the cities. Under the slogan, “Acting Together for Greener and Cooler cities,” the annual meeting was designed to share data, information and experiences of urban forest development in contribution to the United Nations Sustainable Development Goals initiative. Among 17 sectors focused on by the project, the forestry meeting has been launched to create a regional platform to discuss ways to make cities and human settlements safe, resilient and sustainable. The meeting runs through Friday. The Seoul Metropolitan Government and Food and Agriculture Organization of the UN are also the joint hosts of the event. The members of the meeting are expected to adopt the Seoul Action Plan on Friday. 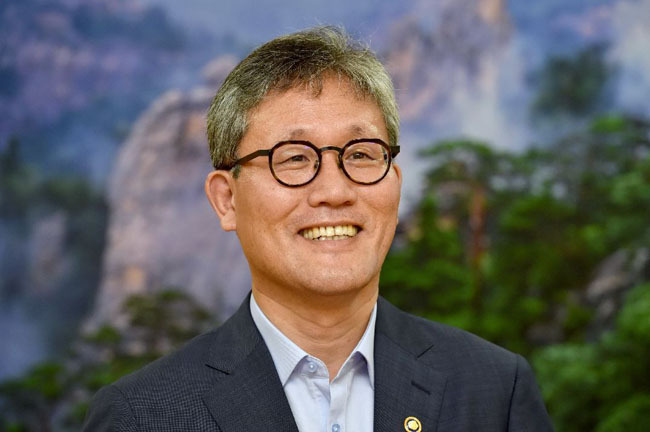 Raising concerns over the deteriorating environment and worsening pollution, Kim Jae-hyun, minister of the Korea Forest Service, urged participants to take environmentally friendly policies to fight climate change. Expanding forest spaces within urban areas has proved effective, he explained. “Environmental problems around the world have come from cities, and that should be resolved by adopting environmentally friendly policies, including urban forests,” Kim said at the opening ceremony of the three-day meeting. Pollutants and other problems started to arise because of overflowing population in the cities. Since 2013, South Korea has spent 1.54 trillion won ($1.37 billion) to create 4,200 hectares of urban forest in 3,400 locations across the country as part of its urban forest policy and the law on legislation of forest welfare. To protect citizens from the constant attacks of fine dust and reduce the heat island effect, the government also plans to expand the second stage of its urban forest policy, the minister said. Not only creating greener spaces, the government also plans to implement policies to turn forests into spaces for education, healing and leisure. During the meeting, researchers from Korea and China are to discuss ways to reduce fine dust in cities and exchange ideas on what trees are most suitable for the projects, the agency said. In the field of urban forest research, experts have highlighted the importance of trees along streets for filtering fine dust and reducing city temperatures, which are increased due to concrete roads and buildings. According to the National Institute of Forest Science, street trees contribute to lowering air temperatures. Areas under street trees were 4.5 degrees Celsius lower on average when measured by thermographic cameras. The level of fine dust in Hongreung Forest near the forest institute was 40 percent less than typical urban areas, the institute said, describing a study conducted in spring. “Not just single lines of street trees, a change in public perception on street trees is needed that they are no longer adjuncts of urban development, but a critical part that functions like the lungs and reduces damage from fine dust and heat waves,” said an official at the institute. Urban forests can provide rich food resources and keep the ecological system sound. Quality of life can be improved for residents near green areas, as well as saving energy, as parks serve as “natural air conditioners” in the city, he added. The idea of creating urban forests is something new to emerging nations in the Asia-Pacific region. And this is why it is important to share ideas and information on utilizing urban forests to improve quality of life and environments, to enable effective choices in the course of urban planning, according to an official at the forest agency. The event invited distinguished experts to share their research and insights on urban forests. Chi Yung Jim, a professor at University of Hong Kong, spoke as the keynote speaker to highlight the significance of urban heritage trees from ecological and cultural aspects, the agency said.